Welcome to the Sparkly Soul Giveaway! Three lucky winners will be able to choose their favorite Sparkly Soul headband in their choice of color and width. 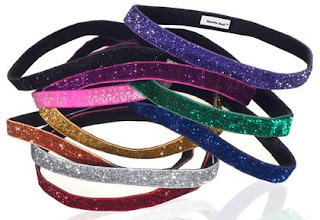 Sparkly Soul headbands are nonslip and no headache - they are the comfortable solution for all athletic fashionistas. Sparkly Soul are ENTIRELY elastic all the way around – 360 degrees of continuous elastic with no black elastic piece in the back! Sparkly Soul is the #1 headband that fits EVERY headshape! The mission of Sparkly Soul is to celebrate women who find their strength and soul while pushing themselves to their limits. Sparkly Soul has become all the rage - it is functional and fashionable - they are an accessory must-have from tiny sparkly tots to stylish college students to sophisticated business fierce females to fab marathon runners. Two thin headbands are often paired together to show school/team spirit - sports players and sports fans alike wear their colors to show support. Sparkly Soul headbands come in a wide variety of sparkly colors and satin colors and in two widths - Thin Headband (retail price $15) and Wide Headband (Retail Price $17). Sparkly Soul headbands are available online at www.sparklysoul.com. Sparkly Soul has set up a special coupon code for all our lovely readers. Just use promo code SPARKLYSOULINC from now through 9/18 to save 15% off at checkout! Here is the part you were really looking for, right? Enter for your chance to win 1 of 3 Sparkly Soul headbands of your choice using the Rafflecopter form below. Giveaway ends September 23rd and is open worldwide. Sparkly Soul is responsible for prize fulfillment. Good luck!